Hi. I am the developer of "Bookmark Favicon Changer"
After Firefox 22 release and "bookmark favicon changer" stop working. I got a lot of emails about this. I always said that I can't fix it. But one user tell me that he don't need perfect add-on. Just stable enough. He want to try and take a risk. I said, yes. I can make a new working "bookmark favicon changer" but in exchange with some lower performance and stability. So, the new version 2.00 is created. - Fixing Firefox 22 asynchronous favicon function problem. This is a main problem. I fix it by making my own synchronous function by spinning the event loop. This will make Mozilla reviewer not happy. - Fixing Firefox 22 tree view problem. Favicon not show in bookmark manager. - Fixing Firefox 23 obsolete function making embed favicon in JSON bookmark backup file not work. - Fixing Firefox 23 bookmark manager not embed favicon when backup. - Fixing Firefox 24 embed favicon in JSON bookmark backup file do not work due to Mozilla change function backing up bookmark into asynchronous. This is a bigger problem. Bigger than Firefox 22 problem. Changing in this function make embed favicon impossible. I need to use an evil way. I create a new function and replace this problematic function. This fixing is so evil. It destroy all hard work of Mozilla in backing up bookmark by turning back it's behavior back to Firefox 21. If Mozilla's team know this, they will be very angry. 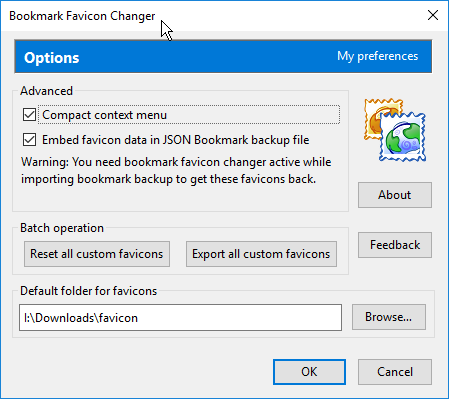 This evil trick will make "bookmark favicon changer" work again, but will make this add-on to be an unacceptable hacking add-on that Mozilla will never approve it. So you will not see this version in normal page of Mozilla Add-on, it will change to self-host add-on. - Firefox 26 is compatible. No need to fix. You will get lower speed when you backup bookmark. Firefox will get slower when quit because Firefox backup bookmark when it quit. By theory, this can happen because my fixing method is an unsafe way. With carefully writing the code, the crash should not happen or happen very rarely. During testing my add-on, I never see any crash. So I can say that it is quite stable. Due to this add-on is self-host and I still not success to make it auto-update. You need to visit this my page to see for newer version. - Risk to incompatible with newer version of Firefox. This version is now full copyright. Please see the condition to use at my page. Also download link is in my page. I've installed your new version info a test profile and so far I see that it's working fine... my main needs for it is to modify folders and it looks like it does the job very well... I'll be playing with it and will let you know if I find anything odd with it. Thank you very much!!!! Thanks for hacking this add-on Back to Life! Will this cause any problems when using Mozilla's Sync or Xmarks to back up my bookmarks?? Oh a thousand THANK YOUs!!!!!! I RELY on this wonderful, beautiful, simple (appearing) add on, and was heart broken when it was murdered. I have spent the last several months trying to figure a work-around, no joy. I bitched and yelled every place I could think of--for all the good that did. I'm on Pale Moon 24.2.2, and Bookmark Favicon Changer v.2 works just fine here! The thousands of us who use(d) and love(d) it owe you huge debt of gratitude! Man, I knew you could do it. A big donation will come your way soon. streetwolf wrote: Man, I knew you could do it. A big donation will come your way soon. Yeah... I'd like to do that too... but, can't see where a donation button is... not on AMO nor the authors site... pity... it is such a good extension... makes users happy, happy, happy . OMG - I need to fix it again in FF27. - Now this extension can autoupdate. - Better coding reduce risk of crash. To this day, I still haven't found a Firefox addon that can replace this addon. I just downloaded the latest version from the the link posted above. Thanks! How could I export / import the favicons to another Firefox? Settings in both of the Firefox's..
Last edited by LIMPET235 on December 5th, 2017, 4:50 am, edited 1 time in total. Dirki wrote: How could I export / import the favicons to another Firefox? But this has nothing to do with this addon. Well, well, actually I would not think so. Also it's been broken for several versions now. Didn't know that, it does not work?